Alignment within your organization has a direct and indirect influence on your bottom line and your competitive edge. Aligned organizations excel at both tactics and strategy. Aligned organizations include every facet of the value your organization provides to clients, staff/employees, vendors, alliance partners, community relationships and referral sources. Gio Group provides services to enhance organization alignment, a few of which are listed below. When organizations decide to change their paradigm and find a new way of operating, getting people’s buy in and support of the change is critical to the change’s success. Change is not optional and change is neither good nor bad. It is often a matter of how people look at it. People can choose to be proactive or reactive, to fight or flee, to become despondent or optimistic, to resist or accept. Gio Group provides an approach to dealing with change and communication strategies that includes educating people on the change taking place, accelerating their buy in to the change and integrating the “new way” with minimal disruption to clients and productivity. It is critical that the processes and people who bring in the work and service clients are aligned. If your organization includes well-established processes and people’s buy in and provides your workforce with the right tools and training, alignment will naturally happen. Otherwise, these disconnected systems will result in damaged client relationships, a dissatisfied workforce, operational inefficiency and unmet financial projections. Gio Group can assess your current processes for generating new business, managing the work and servicing clients for future growth, and determine how well people are communicating and executing processes and provide strategies and tactics to strengthen alignment between work groups. Knowledge that is not shared or leaves when people walk out the door puts organizations at a disadvantage. A competitive edge is sharing best practices within a group and across different geographies and ensuring critical knowledge does not walk out the door when people leave. How does a relationship partner who has serviced a key firm client for twenty years transfer those special nuances concerning decision makers and client information to others in the firm? Knowledge transfer is a conscious strategy that uses approaches to help information and know-how flow to the right people at the right time. Gio Group can assess, design and execute a knowledge transfer strategy to ensure explicit knowledge or difficult-to-transfer information and best practices are shared and available to others to enhance productivity, improve efficiency and retain key client relationships. Women leave their jobs because most employers lack a strategy for developing women leaders, according to Mercer, a global human resources consulting firm. Organizations that want to attract and retain a talented female workforce need to have programs in place that emphasize flexibility and provide work assignment opportunities, recognition and mentoring for women. In the legal profession, women account for 49 percent of law school graduates yet only 17.3 percent make it to partner. The cost not only to a law firm, but also to any organization from the loss of their valued female workforce is huge. Gio Group provides consulting and training that will enable organizations to implement effective women’s initiatives that will result in developing your female talent to boost your competitive edge. 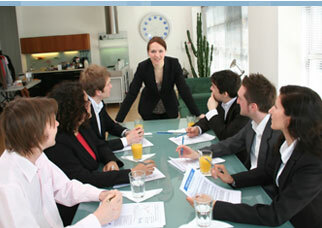 Gio Group helps clients prepare for meetings and lead groups toward reaching successful conclusions. Facilitation begins with interviews to understand the culture and current state and develop a strategy to achieve mutually agreed upon meeting objectives. Gio Group participates in designing agendas and acts as a meeting facilitator to keep sessions moving in desired directions and ensure objectives are met. Facilitation includes counteracting negative participant behaviors that impede group progress, facilitating participation, ensuring meetings result in clear deliverables and summarizing key points. Finally, we collaborate with clients to create action plans that focus on specific goals that are outcomes of the meeting. Sometimes when aligning your organization it is necessary to reduce your workforce. An aligned organization ensures that people leaving the organization can say, “I was treated fairly.” Gio Group provides outplacement services for individuals at all levels. Outplacement clients receive a personal approach to identifying their next best career move, that may include starting their own business, changing careers or even transitioning into retirement. Gio Group introduces a proven career management framework that includes assessing the individual’s next best career move and providing tactics and strategies to meet his or her career goals.